part : defines the balls appearence (usually the first part is the body image, followed by eyes and other features). shadow : a shadow image/overlay that only shows above geometry. 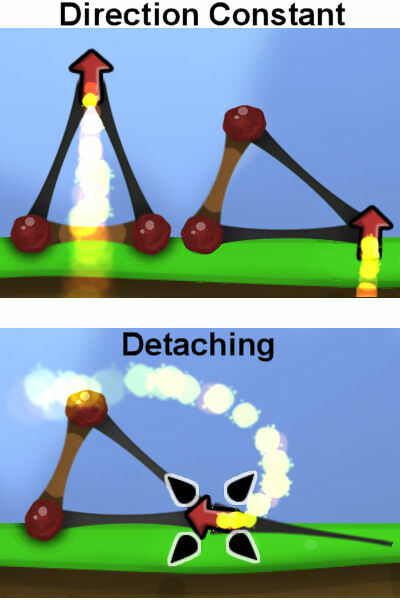 detachstrand : image and length of detaching visualisation. splat : drops of this goo, shown when the player clicks on or releases this ball and when it dies. All these tags are (strictly) optional and which are present depends on the ball's type. A ball with no part tags will be invisible, a ball with no sound tags will be silent... etc. For descriptions of these tags, and more detailed explainations on their attributes... follow the links. Balls also have a state which indicates what the ball is currently doing, and events which are things that can happen to a ball. These attributes are always (or usually) required for any normal functioning ball. This is the unique identifier for the ball type. It must be unique in the game. It should also exactly match the folder name in which the files are held, and the id entry in the resources file. This defines the shape and size of the solid part of the Goo Ball, it's geometry. An optional variation number may be included as the final parameter. This number defines the variation in size of the balls and thickness of the strands. It can be in the range 0 -> 1, although values above 0.5 are not recommended. The variation can be included on both circle and rectangle balls. The maximum number of strands this ball will attempt to connect when being attached to a structure. This does not affect the number of strands which can subsequently be attached to it. If 0, this goo will not attach to a structure. If 1, this goo will attach to a structure with only 1 strand. If 2 (or more), this goo will only attach if 2 (or more) strands can be formed. The material the ball is made of. When a ball is "climbing" on a structure, it can have a different mass to when it is walking on the ground. Note: This value can also be negative... with "interesting" results. Defines the masss of the ball while the being dragged by the player. Only used on Blocks and Windows balls, and only affects how the ball reacts while being dragged. NB: Must be greater than 1 to avoid game engine crashes, "low" values (<5) cause a glitch when the ball is dragged near an open pipe. These attributes govern the actions of the Goos when they are "left alone"
Will jump onto and climb on strands NB: Interacts with climbspeed to determine if ball actually climbs or not. In a force field : mass is irrelevant and will lift antigrav Goo Balls regardless of the type or mass. eg. Balloon : antigrav=4.5 will lift a structure made of 4 balls of any type. Will not lift a structure of 5. This value can also be negative, which makes the ball heavier when it is attached. The ball is fixed in position and cannot be moved. Used mostly for Anchors and Dispensers. Will jump in the air when woken, if jump values are specified. Will also form new strands (up to strands) with other attached balls after is it attached. If set true, causes the ball to "freeze solid" once it stops moving, in effect locking it in place. The ball is automatically "unfrozen" if you pick it up and move it, or detach it from the tower. Causes the "floating block" effect when another block is removed quickly from a pile. If visualdebug is enabled in a level, disabled / frozen ball show in red. If specified, sets the "life span" of the Ball in seconds. Once this time runs out the Ball will automatically die. Dampening factor for falling / flying movement. Used on balloon-type balls to reduce fast movement and make them "feel" like the have air resistance. Values above about 0.2 cause a glitch when throwing the ball quickly. Some balls require additional force to be able to "walk"
common_albino is not set... but is still able to walk OK. If set, then when attached, the ball will extert a force on the structure. The thrust value is the magnitude of the force. Its initial direction is set when it is attached to the structure. Specifically, If the ball attaches 2 strands to the structure, then the thrust will be along the bisector of those 2 strands. 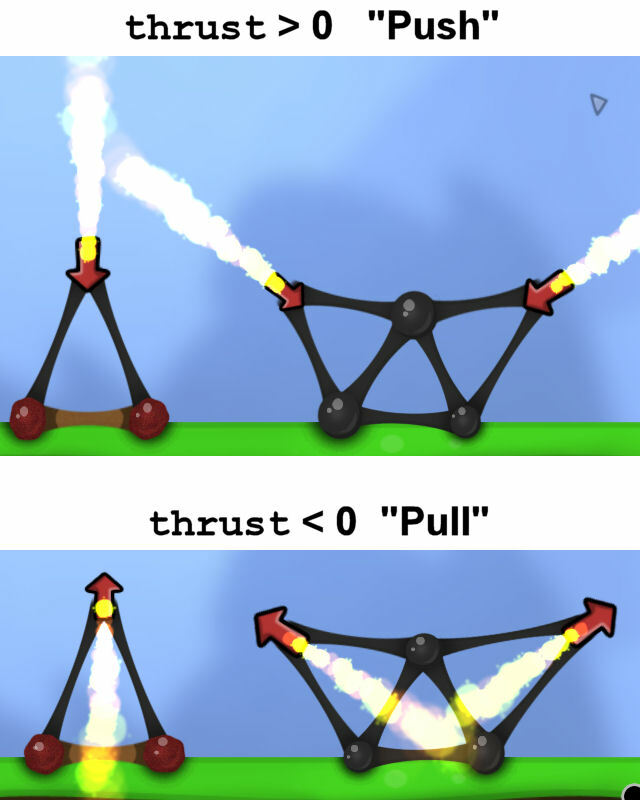 If the ball attaches any other number of strands, the initial thrust direction will be random. A thrust value of 7.5 will (just) make a mass=30 ball "weightless" in a gravity field of 10. These attributes control how the Goos respond to the Player. If True the ball is grabbed by whereever it is clicked, and will rotate about that point. fling is what happens to Bit and Pilot balls when you grab them. The first number sets the maximum length of the shooting arrow. The second number is a multiplier to calculate the force when the player releases the mouse button. Original Balls used 200,2.5, setting 2.5,200 gives the same speed, but the arrow is almost invisible. Because the multiplier calculates a force, lighter balls go faster than heavier balls with the same settings. These attributes control how the Goos interact with various elements of the level.. pipes, spikes etc. If set to false, these Goos have NO effect on the autobounds / explored area. These attributes govern how the Goos behave when they encounter other Goos. When set to true this Goo will not accept strands. and is currently "stuck" to something. Set False on StickyBomb and Pokey so you can't attach to them when they are not attached. When set true, allows strands to connect to this ball when it is unattached and falling. Never used (set to true) on any original ball. For more information, see this reference page. Note: Stacking behaviour breaks down in range of an open pipe, and the blocks slide through each other. This attribute also has another function. When set to true, the ball will explode / shatter when it dies, as if it were a geometry instead of a Goo Ball. The maximum speed the ball can be moving be attached to a structure. These attributes control the Goos look, but do not significantly affect game play. If Invalid or omitted the Goo Balls will no blink. Shrink and hide part marked as eye when cursor is "far away"
Set to false the eyes remain open and "alert" at all times. Set to false the pupils follow the direction of movement or stay still. Allows the Goos to change size when they are in a particular state. These attributes define how the ball changes size in response to mouse actions. The rest are a list of scalefactors, the ball will smoothly change between all these factors in the given Time. Only used on UtilProductLauncherScreamer to produce the "Gun Rising" sound effect. These attributes control whether the Goos are flammable, and how the behave when lit. breaking Force at Goo location when it explodes. Set to 0 the Goo will not "explode" and will just die. The breaking force reduces linearly from detonateforce at the center to 0 at this distance. * This is related to the 'break=?' tag of geometry... but Shhh! If geometry in the level has the break=X tag, it will explode when that much force hits the center of the object. Additional particle effect on explosion, the ball also dies so "death splat" will also display. Must be a Point-Source Non-Repeating particle effect. flammable : true /false : Unused/Irrelavant. this ball contains other balls, which will pop into when it touches an object with 'ballbuster' tag. ie. A ball cannot contain itself and a parent ball cannot contain a child ball which contains the parent ball. Time takens for the "mother" ball to shrink away to nothing. Gradually over this time it releases its child balls. Original Balls set to around 0.25, but can be longer. Gives a random delay between min and max (in seconds) between the ball being "busted" and it popping. Note: popparticles display immediately on "busting", popsound plays after the delay.